In 1984, Dr. Dave Christensen retired from SIUC after teaching for decades about the need for a sustainable balance between what the Earth offers and demands put on the Earth by humans. With this award, Dr. Christensen hopes to encourage Geography students to focus on this critical relationship between the Earth and people. Students must gather and analyze data or analyze and critique some program or strategy, at a local, medium or even a global scale, that looks toward achievement of a sustainable balance between the human family and the Earth. Students must be an undergraduate major in Geography and Environmental Resources. Finished projects will be judged prior to the annual spring "Poster Session" by a three-person departmental committee. 2017 - Kayla Newsome, "Analysis of Polystyrene Foam Food Containers in Downtown Carbondale, Illinois"
2016 - Tonya Atherton, "Distribution of Trash on Campus Lake"
2014 - Karl Mueller and Meredith Wolfe, "The Effects of Brownfield Development." 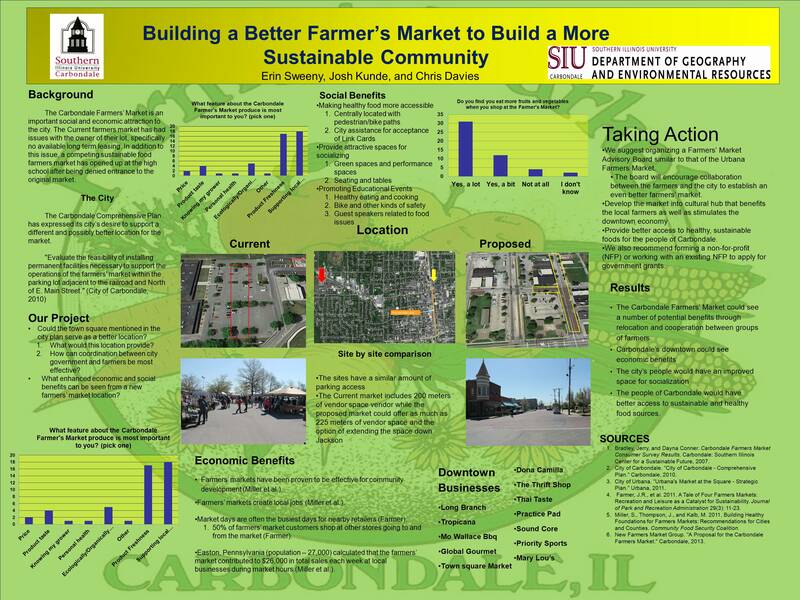 2013 - Erin Sweeny, Josh Kunde, and Chris Davies, "Building a Better Farmer's Market to Build a More Sustainable Community"
2012 - Alison Crim, "Food Works: Local Sustainable Food Systems Development for Southern Illinois"
2010 - Megan Baskerville, Brock Harris, Sarah Heck, and Katie Smith,"Carbondale Floodshed InteractiveMap." 2009 - Jonathan Dyer, "Ten Step Guide to Developing a Campus Sustainability Plan;" Melissa Brandt, Paul Connolly, Leah May, Rebecca Tally, "SIU Local Organic Garden Initiative of Carbondale"
2008 - Daniel Flaherty, "Precision Agriculture Data for Developing Sustainable Land Use Policies"
2007 - Kyle Johnson, Gavin Youngstrum, and Marcus Polancic, "Nitrate Levels in the Big Muddy River"
2006 - Aaron Goldsby, Jessica Korando, Mark Larsen, "Study of Economic Loss Due to Flooding in a Southern Illinois Township"